This event was jointly organized by the Universal Rights Group and the Geneva Environment Network, in collaboration with he UN Special Rapporteur on human rights and the environment, the International Organisation for Migration and the Climate Vulnerable Forum. It took place at the International Environment House I, on Monday 26 October 2015, from 12:00-14:00. In October 2014, in his first press conference after being appointed UN High Commissioner for Human Rights, Zeid Ra’ad Al Hussein, spoke of the ‘stark and vital’ implications of climate change for the full enjoyment of human rights, and drew attention to the ‘multiple implications’ of climate change ‘for displacement, statelessness, land-rights, resources, security and development.’ Some may find it strange that the UN’s most senior human rights official would use his first press conference to highlight an issue seemingly far beyond his official remit: climate change. However, as the High Commissioner made clear, global warming is not only one of the greatest environmental challenges of our time, it is also one of the greatest human challenges, with immediate and acute implications for the enjoyment of human rights. With that in mind, the 21st Conference of Parties (COP21)  to the United Nations Framework Convention on Climate Change (UNFCCC), to be held in Paris later this year, will not only be one of the most important environmental conferences ever held, but also one of the most important human rights gatherings of the past half-century. The ability of states to reach – or not – a new and ambitious global agreement in Paris will have a determinative impact on the lives, prospects, hopes, dignity and rights of millions of people around the world. The consequences of climate change for the enjoyment of human rights have been considered and recognised by the UN on many occasions. Both the UN Human Rights Council (the Council) and the Conference of Parties to the UNFCCC (COP UNFCCC) have recognised that climate change impacts, such as rising sea levels and more frequent and severe extreme weather events, undermine a range of internationally-protected human rights – from the rights to water and sanitation, to food, to health, to adequate housing, and even to life. What is more, the Council and the Conference of Parties have acknowledged that these consequences are felt most acutely by individuals in already vulnerable situations, such as young children, the elderly, persons with disabilities, and indigenous groups. This, in turn, raises concerns about equality and non-discrimination, and highlights the issue of ‘climate injustice’ – that those suffering most due to climate change have contributed least to the problem. The international community has also repeatedly called for human rights principles to be integrated into global climate change policy responses, in order to strengthen those responses and make them more reflective of, and accountable to, the needs of vulnerable people. As the High Commissioner for Human Rights noted at his press conference, the human rights implications of climate change are particularly striking in the case of displacement. Climate change is anticipated to lead to more frequent and severe natural disasters, and in some cases its impacts may render certain parts of the world uninhabitable. Some people will seek to migrate before conditions deteriorate, while others will be displaced by sudden-onset disasters (e.g. cyclones) or slower-onset processes (e.g. drought). In other cases, governments may relocate people out of hazardous areas for their own safety (i.e. planned relocation or resettlement). Even if one focuses on just one of these scenarios – displacement in the event of sudden-onset disasters – the scale of the (actual and potential) human rights challenge is enormous. Major extreme weather events have already resulted in significant displacement, and the increased frequency and magnitude of extreme events in the context of climate change will amplify the challenges and risks associated with it. ‘Between 2008 and 2012, sudden-onset disasters displaced an estimated 144 million people.’ In 2013, almost three times as many people were newly displaced by disasters than by conflict. Some 22 million people were displaced in at least 119 countries, mostly by rapid-onset weather-related disasters. The vast majority of such displacement, 97 per cent between 2008 and 2013, occurred within developing countries (almost 81 per cent in Asia). While it is harder to quantify the number of people displaced by the slower-onset impacts of climate change – partly because it is impossible to attribute movement to ‘climate change’ alone, but also because mitigation and adaption over time may mean that people are able to remain in their homes – national and local case studies give a sense of the possible scale of the phenomenon and, by extension, of the human rights implications. For example, in 2011 some 1.3 million people were internally displaced in the context of drought and instability within Somalia. While the vast majority of people displaced in the context of disasters will remain within their own country, some may seek protection in another country. Like internal displacement, this cross-border displacement will be linked both to slow-onset processes (e.g. drought) and sudden-onset events (e.g. a higher frequency and intensity of extreme hydro-meteorological events). As an example of the former, during the above-mentioned drought in the Horn of Africa, over 290,000 people crossed an international border in search of assistance. They moved for a range of intersecting reasons, including famine, conflict, food insecurity and environmental degradation. Displacement can have devastating effects on people and communities, and create complex challenges for recovery and reconstruction efforts. With all this in mind, it is clear that as the international community looks towards the Paris COP meeting in December, it should take concrete steps to ensure that human rights concerns are an accepted and integral part of any new international responses to climate change. At a practical level, this means that the human rights community (led by the Human Rights Council, its mechanisms and the Office of the High Commissioner for Human Rights (OHCHR)) and the climate change community (led by states parties to the UNFCCC) must work together to introduce a rights-informed approach that supports better and more effective climate action. It also means that the Paris agreement, like the Cancun Agreements, should explicitly recognise the important contribution to be played by human rights in shaping an ambitious, fair and workable international response to one of the greatest challenges of the 21st century: anthropogenic climate change. At the same time, the international human rights community, led by the Council, should consider how best to promote and protect the human rights of those directly affected by the impacts of climate change, including people displaced across borders. Discussions over the past several years in the Council demonstrate a broad awareness of the scale of the human rights challenge posed by climate change-related displacement, but to date states have failed to match expressions of sympathy and anxiety with concrete steps to understand the nature of the human rights challenge, and to consider and implement the most effective policy interventions. Please note that this summary is not yet finalized. Barbara RUIS opened the session, presenting the participants and acknowledging the numerous participants at this event. John KNOX spoke about the agreement that will come out of COP21, mentioning that this is not going to be a normal international agreement, most of its important commitments will be made in INDCs, determined by both developed and developing countries. If you add up all those commitments, and they’re all implemented, an increase of global average temperatures of 2.7 degrees is to be expected. He mentioned that there is still a great amount of disagreement, regretting that negotiations are still going on and that there is so much disagreed upon. The question is what will the agreement include and how many decisions will be left to be resolved after the meeting? There’s going to have to be some serious cutting down of the language that refers to human rights, aboriginal rights, etc. in the agreement. The agreement has to be readable and concise in order to survive. It is important to see what happens after Paris and what will be the implementation and follow up. Marc LIMON affirmed that there is a human rights protection gap for people across borders. He stressed that it is important to talk about climate change with regards to cross-border displacement and the current international policy mechanisms to deal with it. Climate change is expected to lead to natural disasters and extreme weather events. There will be impacts on population movements. Some will seek to migrate before issues, some will migrate when a disaster hits. The scale of the actual and potential population movements are profound. 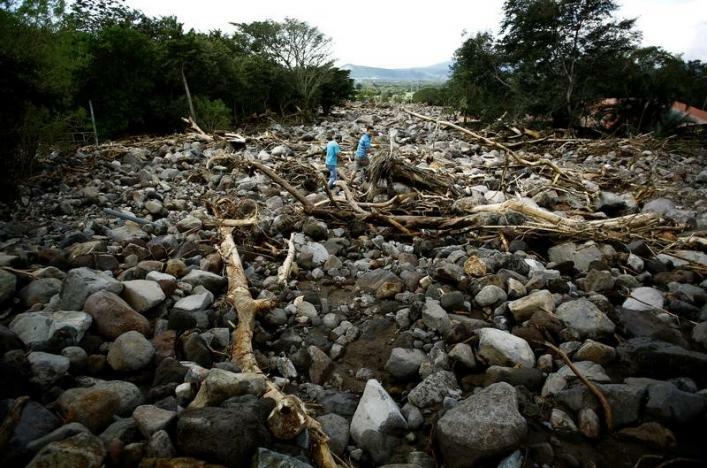 From 2008-2012, disasters displaced 104 million people. 22 million people were displaced by rapid onset weather related events, usually in the developing world. Mass majority displaced remain within their own countries, internal displacement. Human rights risks associated with this challenge will only increase. We should discuss what the international community can and should be doing. Dina IONESCO mentioned that migration, climate, human rights are a cross cutting issue. If we look at cross-border displacement in a narrow way, we might miss some of the key challenges and opportunities related to that topic. Migration, climate, human rights are all sensitive topics. We never used to talk of these three as intertwined, we looked at them as separate issues. Which community are we talking about? On migration we are far from having an international regime. Countries usually have their own individual policies. There are regional, bi-lateral tools that can be a response to cross-border displacement related to natural disasters. Migration should be in the loss and damage agenda than in the adaptation agenda. Human rights protection framework looks at individual needs, in line with the understanding of looking at migration as a mix of factors involved. Migration is in the development agenda and the disaster risk reduction agenda. On climate and human mobility we move slowly from total invisibility of environment and migration issues to visibility. Migration has been in and out of the draft text. Ellen HANSEN mentioned that UNHCR is addressing climate related displacement through a number of initiatives, most notably through its involvement in the Nansen Initiative whose “Agenda for the Protection of Cross-Border Displaced Persons in the Context of Disasters and Climate Change” adopted at the Global Consultation that took place on 12 and 13 October 2015 in Geneva identifies the practices necessary to address the possible protection needs of people displaced across borders in the context of disasters and climate change. UNHCR has, from the very beginning, been a staunch supporter of the Nansen Initiative and is committed to continuing to work with relevant partners to implement and follow up on recommendations from the Agenda. Among the most important lessons derived from the Nansen Initiative is that States can prevent and prepare for increased displacement in future when the right policies are in place. 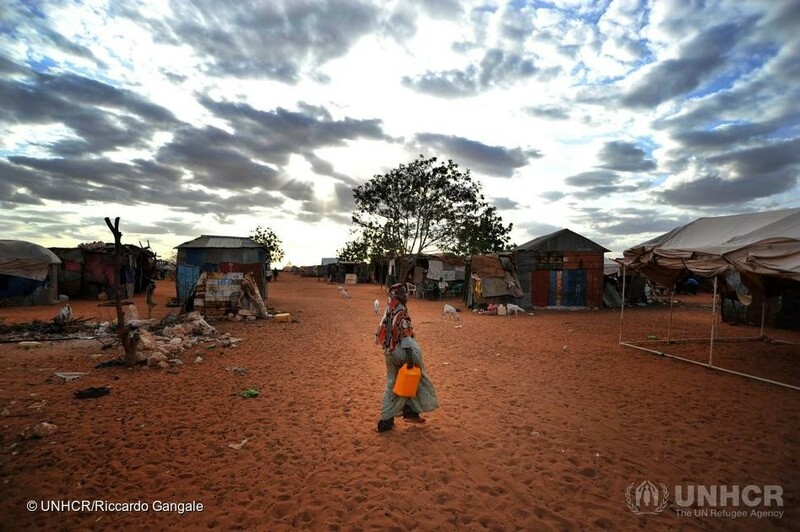 To that end UNHCR has developed updated guidance, together with the Brookings Institution and Georgetown University, on planned relocation of populations threatened by disasters and climate change. 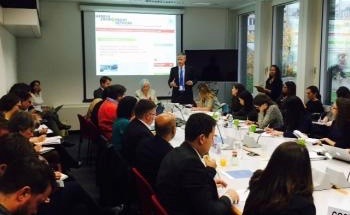 With the Paris Climate Conference only a few weeks away, UNHCR is working with Partners within an Advisory Group on Climate Change and Human Mobility to ensure the Paris agreement take into the issue of human mobility. Hannah ENTWISLE CHAPUISAT reminded that the Nansen Initiative is a three year consultative process led by the Governments of Norway and Switzerland to build consensus on the development of Protection Agenda to address the protection and assistance needs of people displaced across international borders in the context of disasters, including the adverse effects of climate change. They are now ending the Nansen Initiative in its current form. A Global Consultation took place earlier this month in Geneva, on 12-13 October 2015, where 114 government delegations endorsed the “Agenda for the Protection of Cross-Border Displaced Persons in the Context of Disasters and Climate Change” (Protection Agenda). The Protection Agenda, available on the website in English, Spanish and French. (test.disasterdisplacement.org ): sets out the present and future realities on cross-border disaster-displacement challenges, particularly in light of climate change; identifies a tool kit of effective practices for 1) protecting cross-border disaster-displaced persons, and 2) managing disaster displacement risk in the country of origin; identifies three areas for future action to implement the Protection Agenda and address remaining gaps (Collecting data and enhancing knowledge on cross-border disaster-displacement; Enhancing the use of humanitarian protection measures for cross-border disaster displacement; Strengthening the management of disaster displacement risk in the country of origin- (for example, integrating human mobility considerations with climate change adaptation strategies)) There will be follow up, although this is still be discussed by the Nansen Initiative Chairmanship and its Steering Group of States. Happy that IOM and UNHCR have already committed to be part of any future institutional arrangements. The Nansen Initiative has contributed the findings from its consultative process to the UNFCCC process through the production of policy briefs, side events, and the CVF submission emphasizing the importance of addressing human mobility within the process. During the Global Consultation, a number of delegations that made statements emphasized the importance of including disaster displacement within the new climate change agreement and/or COP21 decision. The Nansen Initiative will be holding a side event at COP21 in Paris (in collaboration with the Norwegian Refugee Council and the Fridtjof Nansen Institute) on Wednesday, December 2 from 6:30 to 8pm. During the discussion Yves Lador (Earthjustice) mentioned that we need one more meeting before COP21 so we can go in with something concrete and easier to negotiate. At some meetings experts don’t know what their own countries do on these issues – experts therefore have to work together. We need better communication. John Knox mentioned that a lot of work needs to be done after this agreement, financing, technical support, displacement, all of which will have human rights implications. Framing things through a human rights perspective will help deal with these issues. Gaps aren’t bad, it just means that more steps need to be taken afterwards. Therefore a lot of work to be done after Paris. One of the things we were criticized for in Cancun is that a lot of the climate change negotiators didn’t understand why we had to make things more difficult by adding human rights into the negotiation. It is useful to have this human rights language, Paris is the start of the process. We shouldn’t be obsessed however, with having specific wording in the text. Even if we don’t use the words “human rights,” it’s implied. It was also mentioned that the Protection Agenda is important, providing different models and regional solutions catered to that region’s particular situation.